Is Copenhagen getting the world’s longest bike rack? No, but they are getting 1,000 new bicycle parking spaces before summer. How to create more bike parking? 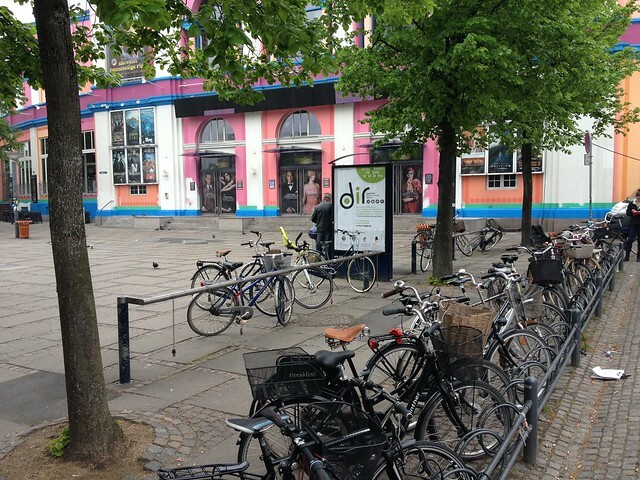 Insufficient bicycle parking challenges cities across Denmark. This problem will spread to many cities around the world as they work to increase cycling; when a city’s bike modal share rises so does the need for bicycle parking. And what will happen if the modal share doubles or more? There is a current and continuous need for keeping focus on establishing more bike parking facilities – in the right places. But the denser the area, the more difficult it becomes to find free space, and often you need to create space. This can be done by establishing projections in the sidewalk to craft more space at street corners, or by cancelling car parking spaces, which gives 10 bike parking spots per car parking space. Establishing 500 meters of bicycle parking, in other words 1,000 spots, in an already dense city is not easy. Where is the available space? Right now, the municipalities of Copenhagen and Frederiksberg are establishing a new bike share system in cooperation with Cykel.dk. Offhand this would not seem to make room for more regular bike parking, but it does. Before this winter, the original city bikes, which have been in existence since 1999, were removed from their stations, leaving a lot of free space. Of the 99 original stations only some will be converted into stations for the new bike share system. This leaves a lot of available space that cities can convert to regular bike parking facilities. It is one thing if you have some available space. It is quite another that the space is at the right place. All 99 stations have been inspected to ensure that they are suitable. Strange as it may sound, there are actually places in Copenhagen where bike parking is irrelevant. These are places where there are no bikes because it is not a place where cyclists stop and need to park their bike. Inspections showed that almost 60 of the old city bike stations could be transformed into useful bike racks. This creates nearly 900 new bike parking spaces. The many abandoned city bike stations were an immense help but did not quite create the 1,000 new parking spaces the city was looking for. But when you are inspecting 99 sites across the city, you might as well keep an eye out for other possibilities while you’re at it. Planners found space for another 200 bike parking spots just by seeing possibilities and optimising use of space. So look – and space you shall find.